Last week, Stiletto Siren asked me if I’d like to do a guest post on her site. Well if you know Stiletto and know her site, then you know I very willingly jumped on the chance to be a part of Lips, Hips, and Fatshion Tips. For that piece, I talk about transitioning the maxi dress to fall, or at least early fall, but we all know that we have a few weeks left in the summer, so I thought I’d share another summer-appropriate look here. Sometimes I can get pigeon-holed into wearing the same style of clothing all the time because it’s “me”, but then there are days that I want to leave it all behind and try on someone else’s look. I always wore my maxi dresses either without any cover up or with a cardigan/jacket, so I decided to step out of my fashion comfort zone and rock a cropped top instead. 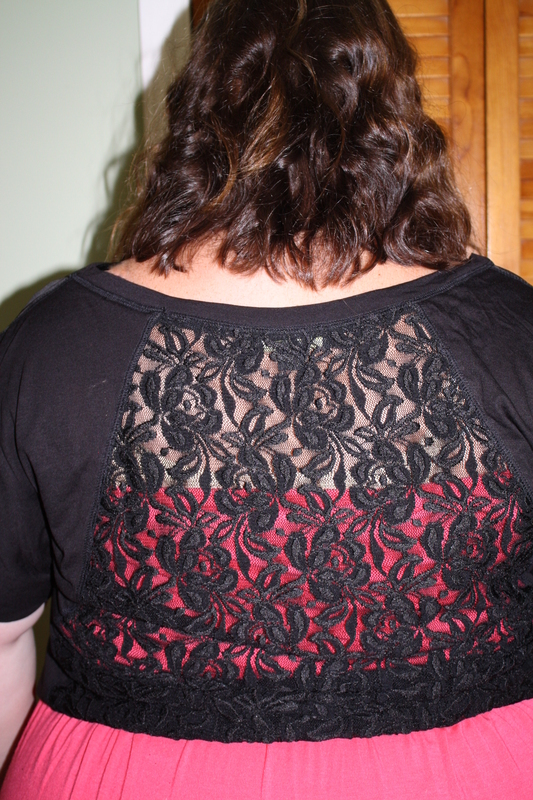 The back of the top has a lace panel that I let the maxi color come through, but I also think it’d look good with a black cami underneath. 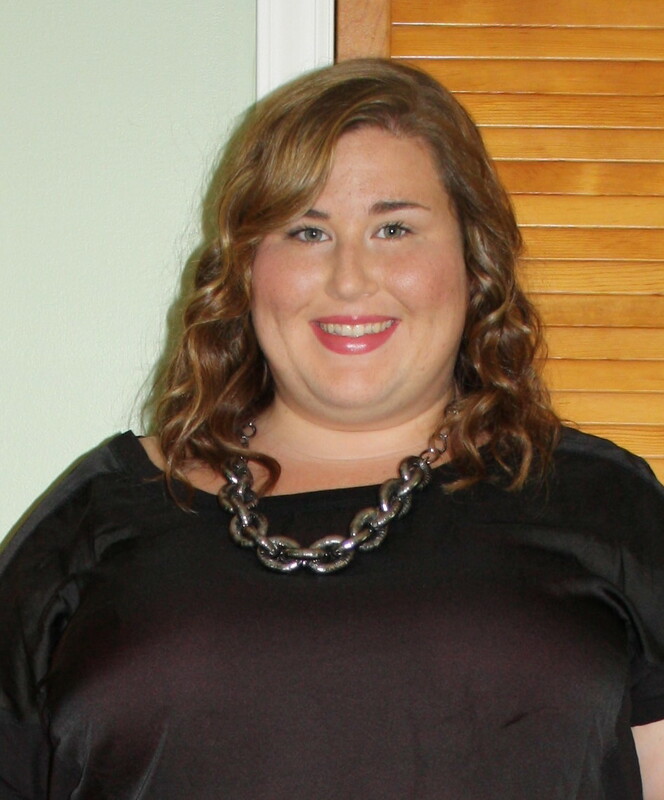 To accessorize the outfit I added on a dark chain necklace that brought a little shine to the outfit. I’m kind of in love with this chain necklace, so I’m sure by the end of winter, you’ll be thoroughly annoyed with how often I wear it. 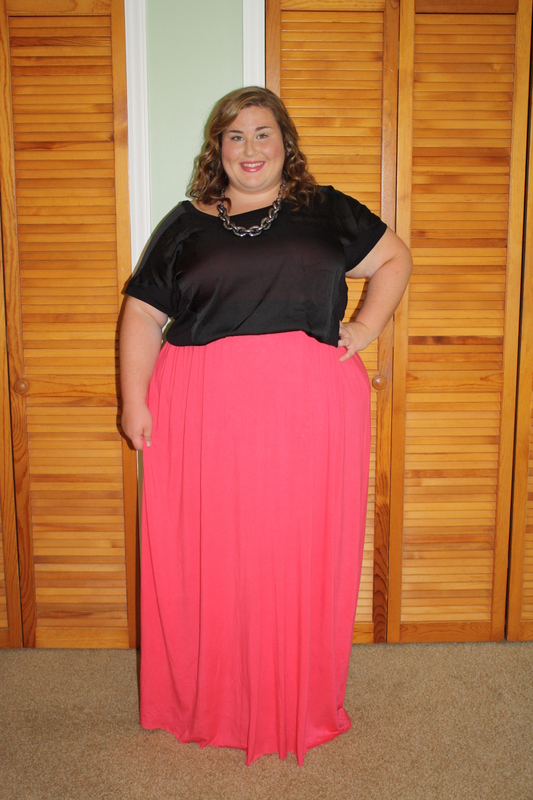 I’d absolutely love it if you’d go see my guest post on Stiletto’s site where I take the maxi from summer to fall! How do you wear your maxi dresses in the summer time? Are cropped tops a yes or no for you? You look lovely! I really like your hair. I have one cropped top I’m not sure I really like them! Thanks, Claire!! I’m finally falling back in love with my hair, which is nice because it’s been awhile! This is the first cropped top I like, and I’m not sure how often I see myself wearing it. It’s a tricky item for me. I love this look! 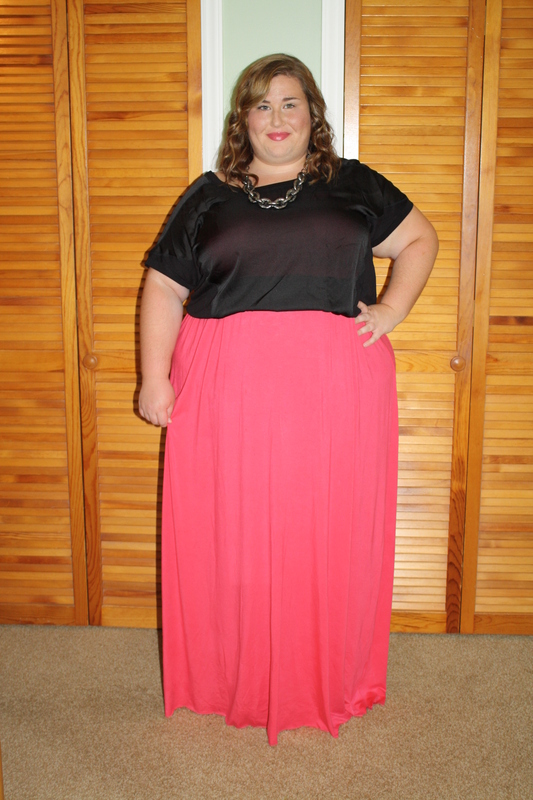 I tried to replicate this look with a maxi skirt, it sort-of worked, but didn’t look this good. p.s. I think the way you’re wearing it now looks great! No need for a black tank. Thanks, Piper! Will you be posting it on your blog? I’d love to see it! I don’t own any maxi skirts, but I’m thinking I need to bite the bullet and find one I love. It’d be so much easier to wear. Thanks for the feedback! I don’t have many people to bounce ideas around with, so I love hearing what others think about how I pair things. This outfit is simply amazing! I don’t think you need to wear a black tank under it. The contrast of the black lace with the coral is really nice! I love how you’ve been styling this necklace. I’ve been trying to thrift a thick-ish chain necklace (or heck, any long gold/silver necklaces for layering) for almost two years but have pretty much given up hope. And the necklace is simple but amazing with this outfit! You rock jeans and maxidresses! that maxi is really lovely, you look amazing! Oh wow, that looks fantastic! I don’t go sleeveless so love the idea of a sheer(ish) crop top over a maxi. It just adds a bit of a change from a shrug or cardigan. Your hair is all types of gorgeous! Love this look on you. the black lace and the peachy color of the maxi dress look so great together. Pretty in pink… er.. coral. 😀 See you on twitter!